Poor Crowley’s having bad dreams. No one said it was easy being the King of Hell. At least he has his mum to comfort him. So Crowley has not been won over by his überwitch mother yet. Clearly Rowena has some kind of machinations at work because she pulls one of her magical hex bags out from behind the hellish throne where Crowley had been napping/hallucinating. She certainly has her talents. Castiel is dealing with his own, less graphic, regrets about Claire Novak, the daughter of his former vessel. Cas tells Sam that Claire will hardly speak to him. Sam and Dean bring up Dean killing Claire’s con man friend Randy. Can Sam help his brother escape the Mark? 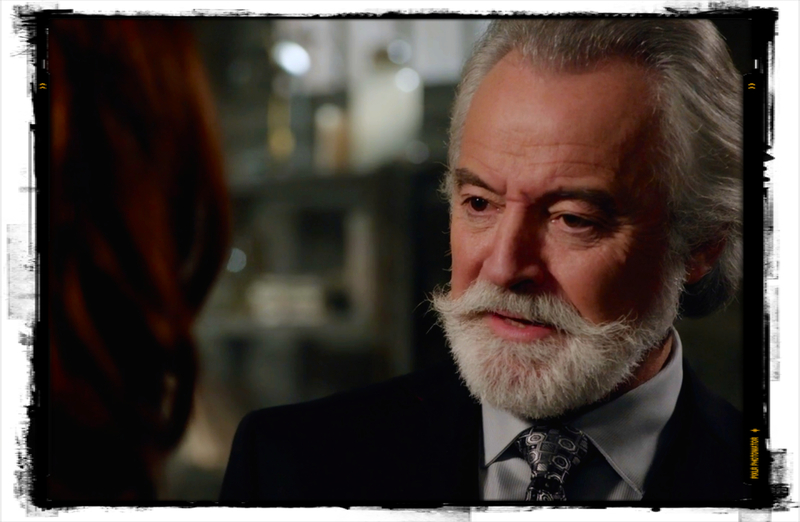 The Santa Claus demon, Guthrie, who we last saw in “Soul Survivor,” stumbles upon Rowena snooping around Crowley’s throne room. Guthrie tells her that the King doesn’t want her wandering around unattended and she claims to be looking for some food. Rowena offers to put in a good word for him to Crowley, but he seems to see right through her, saying, “I’m fine, thank you.” Will Crowley see through his mother? Crowley arrives and sends Guthrie off to manage the bureaucracy of Hell. 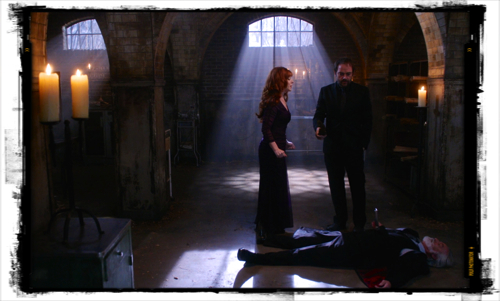 Rowena tries to convince Crowley that others are plotting against him, particularly Guthrie. Rowena tells him she only wishes him success. Crowley responds that he knows what she is up to. “You are shamelessly sucking up so that I’ll free you, so you can run amok and gum up my operation once again.” AGAIN? What operations did she screw up before? They have a fantastic conversation about Crowley’s unresolved mother issues. Castiel is impatiently waiting at the playground portal to Heaven. We love this place and it’s guards. 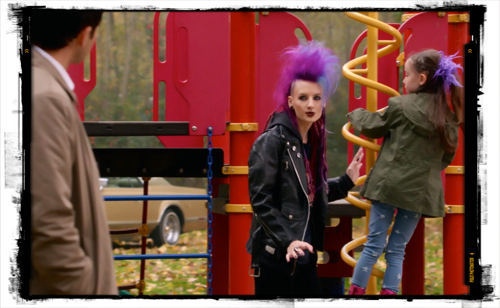 Today the angel guards are a purple-haired woman and a little girl who seems to genuinely enjoy the slide. An angel appears with someone in a black hood – METATRON! So that is Castiel’s plan. If you can’t find the tablet, why not go to the original source—the scribe of Heaven? Cas takes him away and Metatron taunts him about his replacement grace, noting that it won’t last. Metatron sees Sam get out of the car and says, “Hello Sam. Here to kill me?” Sam simply glowers. They bring Metatron to the bunker. Sam tells him they need to know how to remove the Mark of Cain. Metatron acts surprised that Dean is alive. 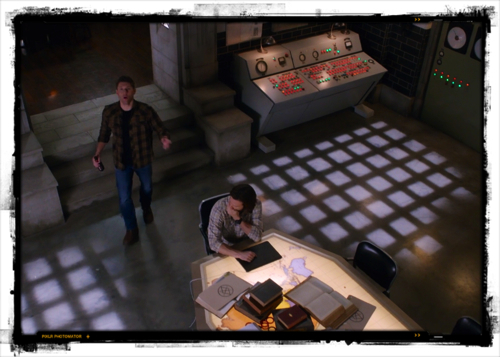 He asks if Dean’s a demon, and when Sam says he isn’t, Metatron deduces, “He’s gone nuclear. Total foaming-at-the-mouth, balls-out maniac.” Metatron is suspiciously good at this guessing game. 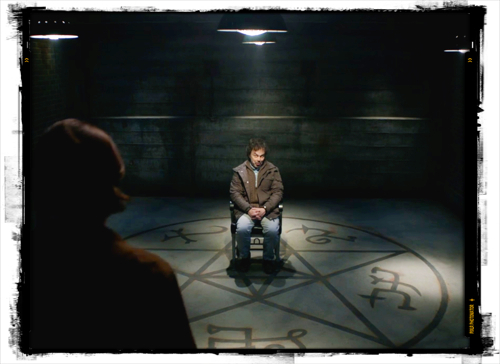 Metatron informs Sam he may know how to remove the Mark, but if Sam wants his help he needs to keep Dean away from him. Sam replies he doesn’t care what happens to Metatron because, “You killed my brother.” Then Dean, looking super scary, slowly walks out from the shadows. Be scared Metatron, really scared. We are. Claire is running out on Castiel again, which is pretty understandable. He’s responsible for her father’s death, resembles the father who is now gone, and his best friend Dean killed the con man Randy who helped take care of Claire. She tells him that Dean Winchester is a monster, and Cas responds, “It’s possible there’s a little monster in all of us.” Claire tells him that defending Dean shows her that she can’t trust him and she leaves. Maybe you should just let the poor girl go, Cas. Metatron: Why do you just assume I’m not gonna be helpful? 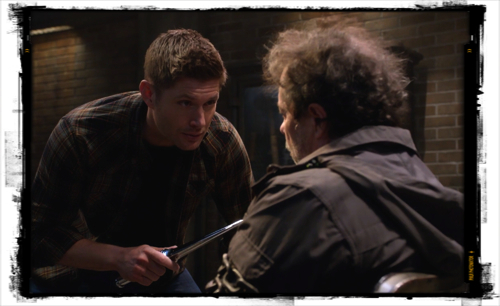 Metatron taunts Sam and Dean a bit, then Dean threatens to carve him up to get the information they want. Metatron tells them they will need “your old bud, the First Blade.” Sam and Dean leave him locked up and discuss Metatron’s intel. 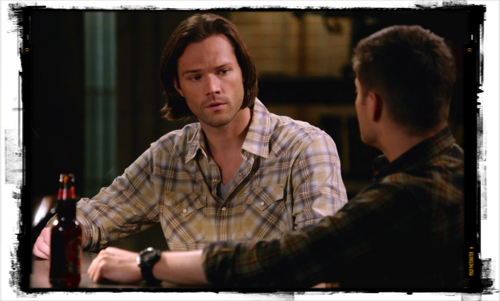 Sam is skeptical, questioning why they should believe Metatron. 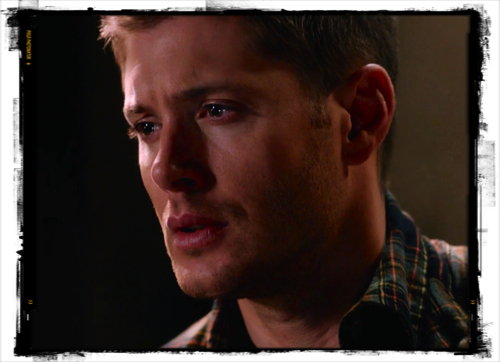 Dean is desperate, asking if they weren’t willing to take a shot, what was the point of bringing him to the Bunker? Dean calls Crowley who answers immediately. When Dean tells him they need to meet, Crowley promptly agrees without asking why. He must really miss Dean. He tells Rowena he’s leaving. She asks if she should wait on dinner and he responds, “You don’t cook. I don’t eat. It’s a perfect arrangement,” and takes off to meet the Winchester brothers. Rowena goes into a cabinet she snooped into earlier and cuts off a piece of Crowley’s tie. 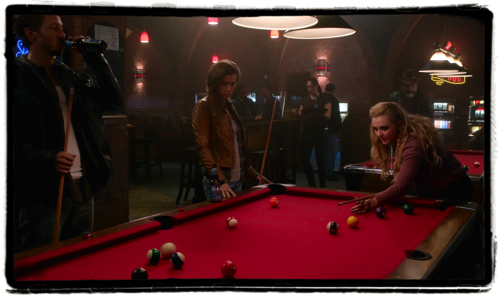 Claire is playing pool with a couple who seem like bad news. They have the look of demon henchmen, but we get no glimpse of black eyes, so perhaps they are just creepy humans. Claire complains about Castiel and Dean, referring to them as “the one that killed my first father” and “the one that killed my second father.” The bad news couple invites Claire to hang out with them for a while. The woman tells Claire, “You seem real sweet, but sweetness don’t clean up messes.” Is that a country song? At their back alleyway meeting place, Crowley tells Sam and Dean it would be ridiculous for him to bring back the First Blade. Meanwhile, Rowena is using Crowley’s tie and some witchy objects to create a spell while she hums “Scotland the Brave.” Rowena casts her spell, which allows her to spy on Crowley and the Winchesters. Crowley tells Sam and Dean, “You want me to procure the most dangerous weapon on the planet for Dean Winchester, the man who goes mental every time he touches it! I thought you wanted to go for a beer, catch a film.” Did you? Did you really Crowley? Crowley tells Sam and Dean that he doesn’t want to give them the First Blade because it’s probably a death sentence for him. They manage to overcome his arguments and Crowley sounds like he may be on board. Sam says that they assumed he stashed it somewhere safe. Crowley responds, “Damn right. It’s in a crypt with my bones,” adding, “I hate Guam this time of year.” It’s a bit surprising that Crowley would tell the Winchesters anything about where he has hidden his bones. 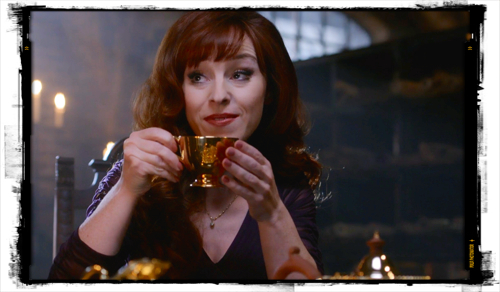 Rowena hears all of Crowley’s true confessions. Rowena tries to get Guthrie on board to do her bidding, claiming the King has left instructions for him. He tries to stand his ground, but she subtly threatens him. She wants him to travel. We see Crowley walk up to a coffin with MacLeod carved on it. Would he really identify his remains when they can be burned to destroy him? He goes in the stone coffin and takes out a fancy First Blade case, but when he opens it he finds it empty. Is Crowley falling for his mother’s schtick? Guthrie shows up in Hell with the blade and Rowena kills the Santa Claus demon. Crowley arrives to find her standing over Guthrie. 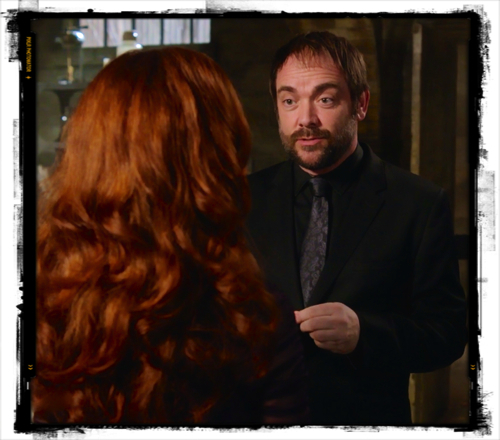 Rowena tells Crowley that Guthrie was conspiring against him, using the information she gathered with her spy spell to convince him it’s true. Crowley finds the First Blade on Guthrie and admits he had a (hex-bag induced) dream about Guthrie attacking him. Very clever, Rowena. Claire is hanging out with the bad seeds she met at the bar outside a creepy camper. 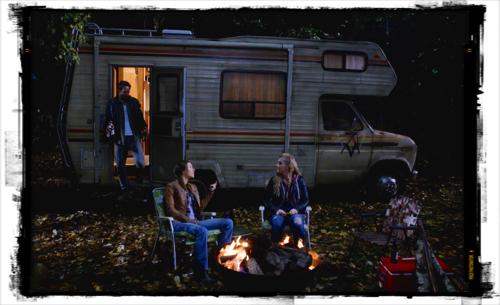 When Claire tells them that Dean keeps calling her to talk, they suggest that she meet with him and that they will take care of him. Claire is not a good judge of character. Cas and Sam realize Dean is no longer in the kitchen and run to the cell where Dean is fixated on torturing Metatron. 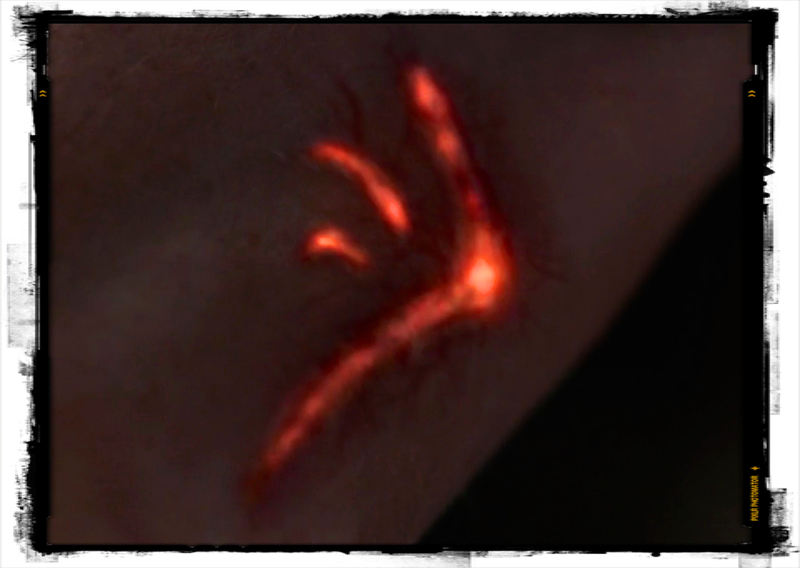 As Dean is carving him up, Metatron intones, “The river shall end at the source.” It’s pretty gruesome for Supernatural. After Sam uselessly flails himself against the cell door for a bit, Castiel finally uses his angel powers to open it. Sam runs in and stops Dean before he can kill Metatron. Cas says he must take Metatron back to Heaven. 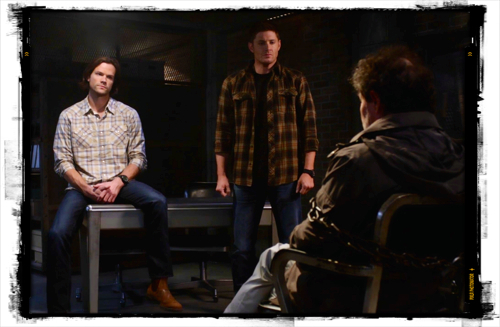 Before they leave, Metatron tells the Winchesters he would die before helping them again. Claire calls Dean and tells him she is willing to meet him. Dean arrives and waits for her while the two bad seeds Claire has been hanging out with sneak up on him. Claire changes her mind and yells, “No,” and Dean evades them. Naturally he overcomes them and Dean is about to kill the couple when Claire yells again. Dean manages to stop himself from killing them. It seemed surprisingly easy. Everyone runs away and Dean heads back to the Impala. 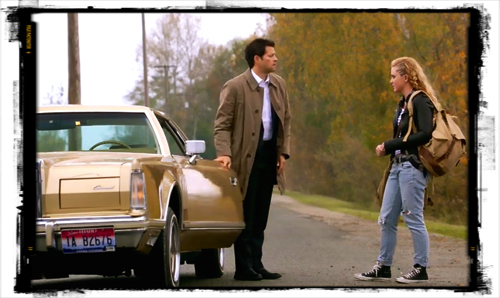 Later, Cas drives up behind Claire as she walks down the road. He tells her he heard her praying to him. She denies praying to him, but he asks if there was anything she wanted to tell him. She tells him, “Wanted to tell you that I thought about what you said. I’m gonna try doing things a little bit different, let go of the little bit of monster in me.” She says she still needs to be on her own but she might call sometime. Before he drives away she tells him, “Not that you care, but… I like you better in a tie.” We couldn’t agree more, Claire. There was a lot going on in this episode, but nevertheless it was a cohesive story as the Crowley/Rowena, Castiel/Claire, and Winchesters/Metatron narratives came together exceptionally well. The Castiel/Claire storyline was certainly the least interesting, but it did successfully connect with the other narratives. Some well-written dialogue and skilled acting made this a strong episode. We like Kathryn Love Newton as Claire in both “The Things We Left Behind” and “The Hunter Games,” but the other guest stars outshined her in this episode. 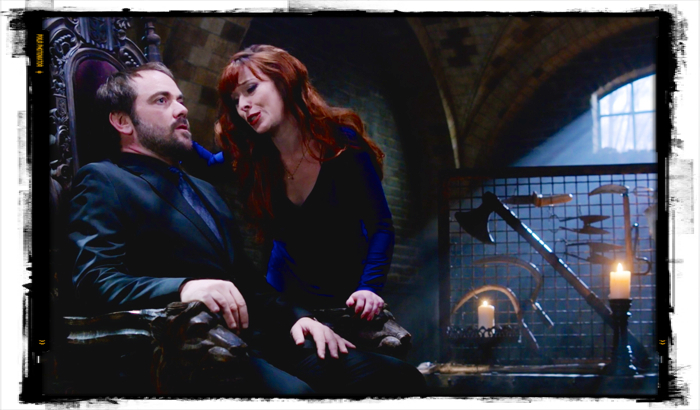 We love watching the interaction between Crowley (Mark Sheppard) and Rowena (Ruth Connell). They have some really great lines and their delivery makes their scenes stand out. Curtis Armstrong as Metatron is also fantastic to watch because he’s funny and engaging. He’s sort of evil, but we kind of love him. Metatron still has a story to tell and we are anxious to hear it. Dean (Jensen Ackles) might have been our Monster of the Week in “The Hunter Games,” as he had a calmness that belied the dangerous storm he was ultimately unable to contain. 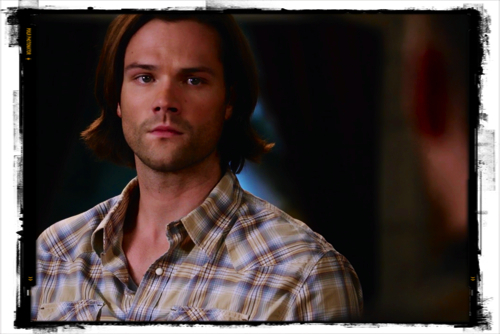 Sam (Jared Padalecki) brought a bit of that boy melodrama we love so much. His delivery of the line, “You killed my brother” was kind of awesome. The Mark of Cain story arc continues to interest us and Crowley isn’t the only one Rowena has under her spell, so we have a lot to look forward to in the second half of Season 10 of Supernatural. 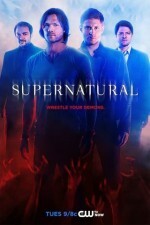 At the end of “The Hunter Games” the end card noted that the episode was dedicated to the memory of Matt Riley (1971–2014), who was a long-term member of the Supernatural crew and played a firefighter in the 2006 episode “Devil’s Trap.” Riley was a stand-in for Jared Padalecki, substituting for the actor prior to filming to assist in production preparations. Riley was also honored through social media by many in the Supernatural family, including actors Jim Beaver, Mark Sheppard, Jared Padalecki, and director Guy Norman Bee.